This has been a great year for experimental big science with ground-breaking findings in particle physics and astronomy. One of the most remarkable breakthroughs has been the success in the search for planets around other stars. The word exoplanet which first appeared in print in 1995 according to google, and has become a popular term in news reports in just the last three, has become ever more familiar this year as reports from the Kepler space telescope have taken the number of candidate exoplanets into the thousands. Kepler is constantly watching 145,000 main sequence stars in our nearby region of the Milky Way galaxy in the direction of the constellations Lyra and Cygnus. It is looking for the tiny dimming of light that tells us that a planet has passed in front of the stars disk. By recording the amount of dimming, how long it lasts for and how frequently it repeats, Kepler can estimate the size and orbit of the planet. In February NASA released a catalog of 1236 candidate exoplanets and this month the number increased to 2326. These have to be verified by ground based observation and so far the catalog of confirmed exoplanets has 716 entries. The real interest about exoplanets concerns whether or not there is other life in the universe, and if there is, how common it is. A whole new industry of exoplanetary statistics has been born with scientists inventing habitability indexes that can be applied to the exoplanet catalogs to gauge which ones could support life. 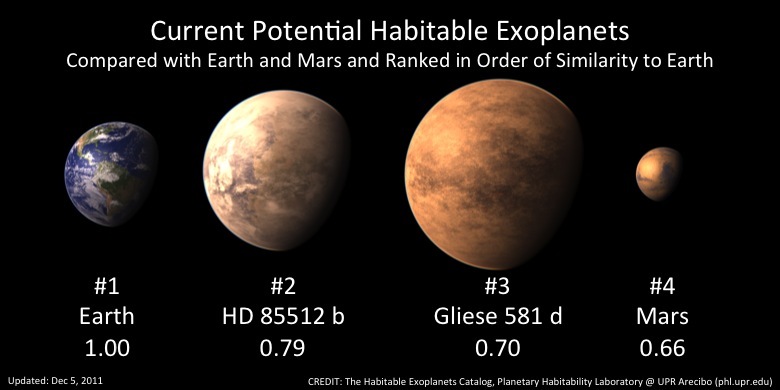 One habitable planet catalog has two exoplanets regarded as more Earth-like than Mars. These are HD 85512b and Gleise 581d, both found earlier this year, but they are rather large to be comfortable for us to live on. If they have an atmosphere it is could be too thick due to the stronger gravity. Already Venus has a thick atmosphere making the pressure too hot and high pressure for us to survive. If we discovered an exoplanet like Venus we would be very excited because it is in the habitable zone and is very similar to Earth in size. Finding out about its atmosphere would be difficult from a distance of many light-years. 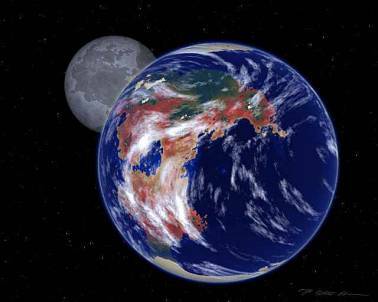 This week some new “Earth-twins” were announced Kepler 20f and Kepler 20e. They are very similar in size to earth but they are not in their Suns habitable zone where the temperature would be about right for liquid water and conditions similar to Earth. It is good news that Kepler has proven that it can find planets of this size but we will need to wait before we find ones where we could really live. It is said that these planets may have been further from their star in the past so that life could have formed there in the past. This just serves to emphasize one more characteristic an exoplanet must have if it is likely to support life as we know it on Earth. It must stay in a stable orbit around a stable star for billions of years so that life can evolve without being obliterated by heat or freezing. 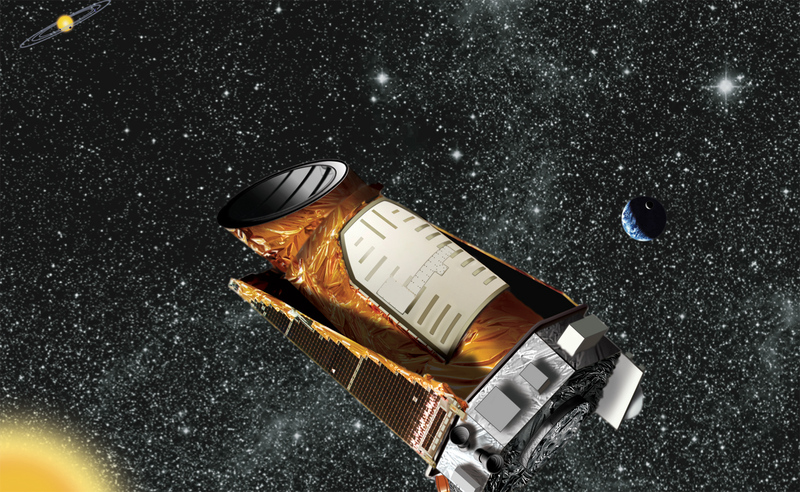 Kepler has a planned lifespan of 3.5 years and may have its life extended. This should give it time to find some more earth-like planets orbiting Sun-like stars with periods of about 1 year. Kepler takes time to find these because they need to pass in front of their star at least twice to confirm their existence and orbit. because Kepler works by looking at such transit events it only sees planetary systems whose disk is aligned with Earth. If it were looking at earth from afar it would have only a one in 700 chance that this alignment occurred. If Kepler finds one Earth-like planet we could guess that there are 700 in the sample they are looking at, which represents 1 millionth of the stars in our galaxy, but will it really find any? My guess at this stage is that it will find a number of Earth-sized planets and a number of small planets in the habitable zone, but the statistics may be against it finding an Earth-sized planet in the habitable zone of a stable star like ours. Probably we will be able to estimate how many such planets there are and it may be something like a million in our galaxy. It could be a lot less. The next step will be tp determine how many are likely to have the right chemical mixture to form water and an Earth-like atmosphere. We don’t yet know the answer, but it is exciting that the data we need to answer these questions is starting to become available. How Earthlike are Kepler’s Latest Exoplanets? I am sure everyone is aware of the latest release of exoplanet data from Kepler that has multiplied the number of known exoplanet candidates by a factor of about five. Kepler detects its exoplanets by looking for stellar transits so it is only going to see them in the rare cases where we are in alignment with the plane of the stars planetary system. Luckily it can look at a lot of stars in a patch of the sky all at the same time. In its first few months it has found well over a thousand by this method. Some of these may prove to be glitches and must be verified either by land-based observations of by repeat transits observed from Kepler. So which is the most Earthlike planets they have seen? To answer this you need to peruse the full set of data which can be found here. Even then the answer depends on what you consider to be the most important parameters to define an Earthlike planet. After due consideration I am going to go for Keplar-268 which has an estimated radius of 1.75 times the Earth, a year of 110 days and it sits at 0.41 astronomical units from its parent star. This should give it an estimated surface temperature of 295 degree Kelvin or 22 degrees Celcius. Admittedly it is a bit large so its gravity is going to be stronger than we would probably enjoy. The estimated temperature that NASA uses is based on the amount of received radiation. I’m not sure if there is any correction for greenhouse effects which depend on the density and content of its unknown atmosphere. In any case it is at least reasonable to assume that its rotation will not be locked to its star so it has a chance of being habitable with liquid water present. On the other had it’s high gravity may mean it retains too much atmosphere and suffers from permanent clouds making its surface very hot and high pressured. This is just the first big release of data from Kepler and more can be expected, especially since many Earthlike planets will not have done a full revolution of their star in the time it has been l0oking. The results so far suggest that when all data is collected there should be some candidates for really Earthlike planets, at least in terms of size and ambient temperature. Once their location is known it will be the job of other telescopes to look at them in more detail. 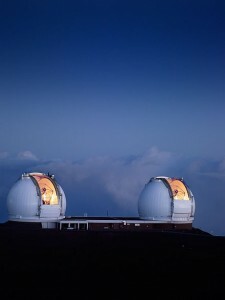 This will include the best Earth-based telescopes using adaptive optics and interferometry to focus in on the systems. A little later the James Webb Space Telescope should take over, if and when it successfully reaches its position to start observing in space.